All Our Price Based on Japanese Yen, Please contact Us for US Dollor price. We accept with your payment by US Dollor or Japanese Yen. Please click the guitar photos, you can see more photos and details. Rare & Dream Collection　Parfect Collector's Piece!! *100% original more than 8.75/10 condition, Hard to find in current market!! *Collecto's piece...higer recommend for collectors. Rare & Dream Collection　Collector's Piece!! *Early '54 spec, Short skirts knobs and Formit case...missing football switch tip. *100% original more than 8.25/10 condition, Hard to find in current market!! *With original rough Formfit case. *Early '54 spec, Short skirts knobs Football SW Tipand Formit case!!. *100% original more than 9.5/10 condition, Hard to find in current market!! *This guitar is cleanest '54 Strat we made a deals before!!. *With original clean Formfit case. *Jul '54 Neck & Aug '54 Body, Rare 1Piece Ash body!! *Only refret and changed nut, 100% original parts. *With original Center Pocked Tweed Case. Rare & Dream Collection　Clean!! *100% original more than 8.75/10 condition, Min playing wears on neck!! *'54 Jun body, '54 Aug neck and Assembly. *With original center Pocket Tweed Case. '54 Sunburst "Headtail"/Maple neck　<VG-2294>　Super Rare!! *Sep '54 Neck and Assy...Supar rare original '54 Sunburst tremolo less. *Well played "Good Lookin" and Amazing fat tone!! *June. '54 Body, Sep. Neck and Oct. Assy...One owner in more than 7.5/10 condition. *Refret and changed nut, otherwise keep original, parfect bakelte parts!! *'54 "Short G" pickups, good lookin and amazing tone!! *With original rought Center Pocked Tweed Case. *June. '54 Neck and Aug '54 Body and Assy in 8.5/10 condition. *Aug '54 Body, Sep '54 Neck and Oct '54 Assy, original "Sunburst" in 8.5/10 condition. *Refret, cnaged nut, 100% original parts, with wild flamed maple neck!! *Parfect bakelite plastic parts, original '54 "Short G" pickups...amazing '54 Tone!! *With original rough Center Pocked Tweed Case. Rare & Dream Collection　Near Mint Condition!! *100% original more than 9.25/10 condition, Super clean, parfect colletor's piece!!! *Noc. '54 Neck & Body, 100% original parts..
*SW-Tip is late 60s Nylon parts and Tremoto Bar Ti is Replacement parts. '54 Sunburst/Maple neck　<VG-2756>　Player's Dream!! *Jun. '54 Neck & Body, "02XX" early serial number '54 "SUNBURST" in 7.5/10!!. *Refret, cnaged nut, 100% original parts, only 7.05 lb super feather wight. Early '55 Sunburst/Maple neck　<VG-2584>　'54 Sounding!! *Nov. '54 Body, Jan. '55 Neck, '55 Outside lookin and '54 Electric parts. *100% original in more than 7.75/10 condition. '55 Sunburst　”Hardtail"/Maple neck　<VG-2148>　Clean!! *1 Piece Ash body with beautifull grain, '55 Sunburst #Hardtail" Strat...Hard to find!! *100% original, Parfect bakelite parts. *Three original '55 "Short G" pickups, Amazing strong and fat tone!! '55 Sunburst/Maple neck　<VG-2709>　Clean!! *1 Piece Ash body with beautifull grain '55 Sunburst in more than 8.75/10 condition. *1Piece Ash body, Early '56 SPEC "Two Tone" Sunburst for collectors!! *1Piece Ash body, Early '56 SPEC original "White Burst" Blond finish!!! *100% original in Near Mint condition, Paerfect bakelite plastic parts. *Including Strap, Tag, Closs, Cord, Case key...One owner's parfect collecto's piece. *1 Piece Ash body with beautifull grain, '56 Sunburst #Hardtail" Strat...Hard to find!! *Only refret and changed nut、100% original parts, , Parfect bakelite parts. *1Ash body, Round Strings tree, Early 56 Sunburst in more than 8.0/10 condition. *Less than 7.3lb, feather weight, Fat and Straong tone!! *Super Rare, original alder body '56 Sunburst "Lefty"
*Musium Piece, perfect piece for collectors!! *We never seen other one before!! *With original "Lefty" Tweed Case. *Alder body, Late '56 Sunburst in 9.25/10 condition. *Minimum neck playing wears and Flamy maple neck!! *Original Owner's photos and sales recipt including!! Rare & Dream Collection　Super Rare & Clean!! *Alder body, Super rare original "Gold Anadized pickguard and backplate"
*100% original in more than 8.5/10 condition...Parfect collector's piece. '56 Sunburst/Maple neck　<VG-2701>　Amazing Player's Gear!! *Sep. '56 Body and Oct. 56 Neck, Alder body original '56 Sunburst Maple neck! *Refret, changed nut, pots, switch, and all plastixc parts. *Three original 50s original Black Bobbin pickups, strong and fat tone!! 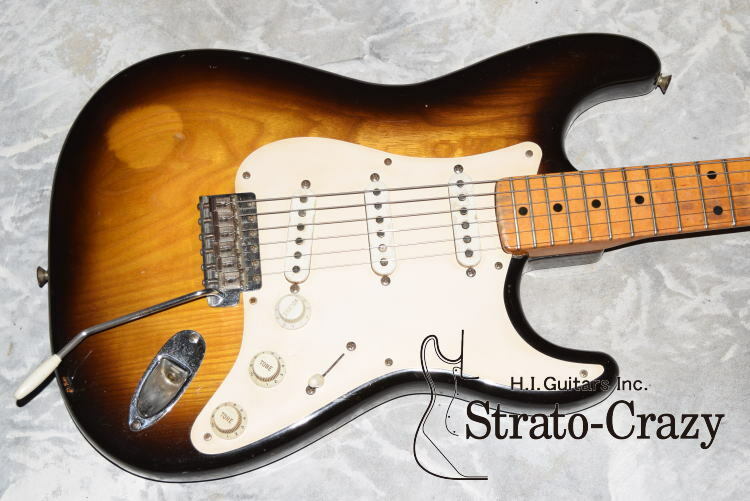 *Perfect collector's piece '57 "SUNBURST" Strat in Near Mint condition!! *The Guitar futured Japanese book of "Vintage Guitar Cafe"
*With clean original Tweed Case. Rare & Dream Collection　Rare/Collectoer's Dream!! *Perfect collector's piece '57 "SUNBURST" hardtail Strat in Mint condition!! *Haed "V" shape neck, Super featjer wight!! '57 Sunburst/Maple neck　<VG-2100>　Clean!! *100％ original in more than 8.5/10 condition, body still keep shining and clean!! *Minimum playing wears on body edge and back. *Feather wight and fat Strong fat tone. *Perfect collector's piece '57 "2 TONE SUNBURST" Strat in Mint condition!! *Haed "V" shape neck, Super featjer wight and strong tome!! *The guitar futured Japanese book "FENDER STRATOCASTER" page 14 and 15. '57 Sunburst/Maple neck　<VG-2777>　Clean!! *Less than 7.2lb suoer feather weight, Hard "V" shape neck and Strong tone!! *Ash body original "Blond" in Near Mint condition. *Parfect collector's piece, hard to find!! *Nov. '57 Body, Mar '58 "V" shape neck, '57 Spec. *100% original, Alder body "3Tone Sunburst" in Mint Condition. *Tremolo instruction paper, Strap, Closs, Cord are including!! *100% original, Alder body "3Tone Sunburst" Lefty in Near Mint Condition. *Tremolo instruction paper, Tag, Strap, Closs, Cord are including!! *100% original, Ash body "Blond" with Gold Anodized Pickguard in Near Mint Condition. *'58 original custom color "Red", 50s Maple neck Custom Color Strat is super rare!! *100% original in Near Mint condition, perfect collector's piece. 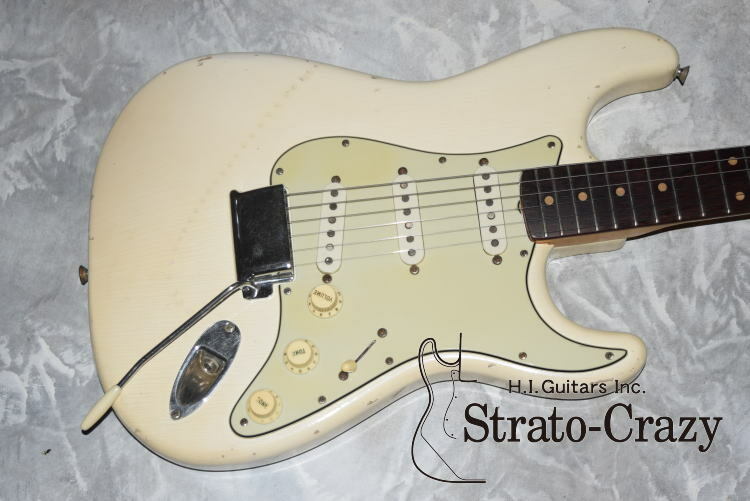 *Expensive, but good chance for getting original50s Custom color Stratocaster!! *First issue of Rose neck Stratocaster, 100% original in 9.25/10 condition. *Super rare original 9 screw holes Mint-Green Pickguard, hard to find!! *Original Owner's manual, Strap, Case key...parfect collector's piece. *With super clean original Tweed Case. *100% original in 9.0/10 condition. *Body and Neck both still keep shining. Collecto's Piece!! *With original Brown Tolex Case. *100% original Rare original Custom Color "Olympic White" in 8.75/10 condition. *Still keep "White" color, no tourned to clean!! *"Olympic White" color is hard to find in Slab neck. *100% original (Never touched any solider joints) in Mint condition..
*With Instruction manual, Strap, Closs and cord...parfect collector's piece. '59 Sunburst/Slab Rose neck <VG-2323> Rare Transitional Spec!! *First year of Rosewood neck, '59 original "Sunburst" Slab Rose neck. *Super rare original 9 holes Mint-Green pickguard, '59 transitional spec!! *100% original in more than 7.5/10 condition, Strong and fat tone!! *With origonal late 50s Tweed Case. *First issue of ose neck Stratocaster, 100% original in 9.75/10 condition. *Body and Neck both still keep shining. Perfect Collecto's Piece! *With super clean original Brown Tolex Case. *100％ original '59 Sunburst "Hardtail" Slab Rose neck in Mint Condition. *Original super rare 8 holes Mint-Green pickguard in '59 Tranditonal area.! *100% original in more than 9.5/10 condition and still keep shining!! *'59 original custom color "Red", Slab Rose neck Custom Color Strat is super rare!! *The color between "Fiesta Red" and "Dakota Red", only 50s Fender color!! '60 Sunburst/Slab Rose neck <VG-1172>　Thank You Sold!! *100% original in 8.5/10 condition. *Recommend for Players and Colloctors both!! *With origonal Brown Tolex Case. *100% original in 9.25/10 condition. *100% original in 9.75/10 condition. *Original Owner's manual, Tag, Tolex case tag and sales recipt and more!! *Super Rare original "Tortoiseshell Pickguard"...Hard to find!! *100% original in 8.75/10 condition. *With original Brown Tolex Case, Tag, Instruction Manual and more!! *Feb '61 Neck & Body, early '61 3Tone Sunburst Slab Rose neck. *100% original (including Frets and nut), Crack free original Mint-Green pickguard!! *Early '61 north polarity black bobbin pickups...fat and strong tone!! '61 Sunburst/Slab Rose neck <VG-2570>　Thank You Sold!! *Sep. '60 Neck and Jan. '61 Body, Strong Three Tone Sunburst Slab Rose neck. *Only refret and changed nut, 100 % original parts! *Crack free original Mint-Green pickguard.! *100% original, Super rare original "Sonic Blue" Slab Rose neck...Haed to fuind!! *Came from Owner KEY's parsonal collection. *Strong fat tone, Cracked free Mint-Green pickguard. *With original Brown Tolex Case, Instruction manual, Strap. '61 Sunburst/Slab Rose neck <VG-2642> Wild Flame neck!! *Dec. '61 Neck & Body, Strong Three Tone Sunburst Strab Rose neck. *100% Original in Beat-Up condition, Amazing Straong tone. '61 Bland/Slab Rose neck　<VG-2704> Amazing Tone!! *Nov. '61 Neck & Body, original "BLONDt" in more than 8.5/10 condition..
*Only refret and changed nut, otherwise100％ original parts!! *Three original Black bobbin pickups, Strong fat tone!! *Super Rare original "Blond" with "Tortoiseshell Pickguard"...Hard to find!! *Three strong 50s original Black bobbin, Strong and Fat tone!! *Original '61 Custom color "Fiesta Red" Slab Rose neck in more than 9.0/10 condition! *100% original with original Bridge cover, Instruction manula and Strap. *Three strong 60s original Black bobbin, Strong and Fat tone!! '62 Olympic White/Slab Rose neck <VG-2112>　Flame neck!! *Rare original Custom Color "Olympic White" in more than 8.25/10 cindition. *Body color still keep "WHITE" no turned to "Cleam"
*100% original, Amazing wild flamed neck!! <VG-2260>　Super Rare & Clean!! *Strong three tone Sunburst Slab Rose neck with original Tortoisheshell pickguard!! *100% original, Body still keep shining in more than 8.75/10 condition. *With original Instruction manual, Strap, Cord and Bridge cover!! '62 Sunburst/Round Rose neck　<VG-2642>　One Owner's!! *'62 original "Sunburst" Slab Rose neck in Near Mint condition. *100% original, One owner's gear with original owner's photo. *Big neck and Fat & strong tone!! *100% original, This is our cleanest Sunburst/Slab neck Strat from 2002. *Original Instruction manual, Bridge cover, Strap and Cord...Parfect collector's piece. *With original Super clean Brown Tolex Case. *100% original, Late '62 Round rose neck in "Near Mint" condition. *Body and Neck both are still keep shining!! *100% original, Late '62 Round rose neck in "Mint" condition. *Original custom color "Fiesta Red" with Round Roseneck in more than 9.5/10!!. *100% original, Body･Neck･All parts...still keep shining and clean!! *'63 Original Custom Color "Candy Apple Red" in Near Mint condition. *100% original, Perfect collector's piece!! *With original White Tolex Case, Bridge cover. *'63 original custom color "Candy Apple Red" in Near Mint Condition!! *100% original, Crack free original Mint-Green Pickguard, Parfect collector's piece. *Including Bridge cover, Instruction manual, Strap, Cord and Closs. *With original White Tolex Case. Rare & Dream Collection　Super Rare Color!! *'63 original super rare custom color "Black" in more than 8.0/10 condition. *Three original 60s Black bobbin pus, fat and strong tone. *With original WhiteTolex Case, Bridge cover. *Spaghetti logo, Gray bobbin Pus, transitional '64 SPEC. *100% original in Near Mint condition. *Crack free original Mint-Green pickguard. *With original No logo Black Tolex Case. *Spaghetti logo, Black bobbin Pus, perfect '63 SPEC. *Only refret and changed nut, 100% original parts in "Beat-Up" condition. *With original rough Brown Tolex Case　<Consigunment>. Rare & Dream Collection　Super Rare & Mint Condition!! *Original super rare "Shorline Gold" in 9.5/10 condition, Parfect collector's piece!! *100% original in Mint condition, Spaghetti logo & Black bobbin pus...parfect '63 spec. *Owner KEY seeking custom color more than 35 years, out of KEY's parsonal collection. *With original Brown TolecX Case. Rare & Dream Collection　Super Rare & Near Mint Condition!! *Original super rare "Inca Silver" in 9.25/10 in Near Mint condition. *100% original, Spaghetti logo & Black bobbin pus...parfect '63 spec. *Body color a little bit turned to "Green", Parfect collector's piece. *Original super rare "Candy Apple Red" in 9.25/10 in Near Mint condition. *With Sprap, Closs, Bridge cover and Strings...parfect collector's piece!! *With original White TolecX Case. *Original Custom Color "Olympic White" in 8.5/10 condition. *100% original, Crack free original "Mint-Green" pickguard. *With original Black Tolex Case. *100% original, Rare original "Dakota Red" in "Near Mint" condition. *The guitar futured the book of "The Galaxy of Strats" page 75. *With original Clean Black Tolex Case, Strap and more!! Rare & Dream Collection　Rare!! *Small headstock, Transition logo, '65 original custom color "Fiesta Red"
*100% original in more than 8.75/10 condition. *Haed to find...Parfect collector's piece!! *With original Black Tolex Case, Strap and Bridge cover. *Small headstock, Transition logo, '65 original custom color ”Olympic White"
*Only refret, otherwise 100% original l in more than 8.0/10 condition. *Feather wight,　Strong "Rock'n Roll" sound. Rare & Dream Collection　Super Rare Color & Mint condition!! *Super Rare original custom color "Fire Mist Gold" in more than 9.75/10 condition. *100% original, Mint condition, Parfect collector's piece. *Super rare Maple body 65 Original "Blond" Rose neck in more than 9.5/10 condition. *Only one small tipping at body eddge, otherwise clear and shining!! *100% original, Three original Gray Bobbin pickups, Pefect collector's piece. copyright©2016 H.I.Guitars, Inc. all rights reserved.